The Pacific War Online Encyclopedia: Emmons, Delos C.
Emmons had been an observer in England during the Battle of Britain and was the commanding officer of Air Force Combat Command at the outbreak of war in the Pacific. 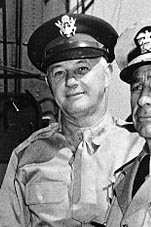 He relieved Short as commander of the Hawaii Department shortly after the Pearl Harbor attack, and worked closely with Pye and then Nimitz to ensure unity of command. In sharp contrast with DeWitt, he pledged to the local Japanese-American community that they would be treated fairly so long as they remained loyal to the United States, and succeeded in blocking moves to relocate all Japanese-Americans from Oahu to the outer islands or the mainland. Emmons worked with Nimitz for an early allotment of as much air power for Hawaii as possible, to free the Pacific Fleet for offensive operations along the West Coast-Australia sea lanes. Emmons assumed command of the Western Defense Command at the Presidio in June 1943, and the Alaskan Department in June 1944.